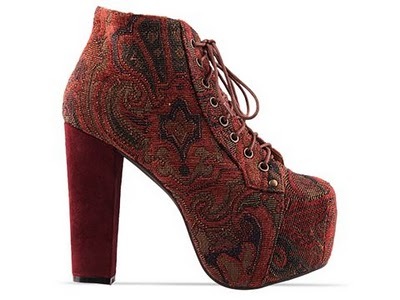 After lusting for what seems like my whole life (real time- about three months) I still want the burgundy, Litas by Jeffrey Campbell. They are affordable (which makes the fact that I don't own them even more ridiculous), I just seem to find other things to spend my pay cheques on (Glastonbury, vintage dressing gowns, appletinis and magazines- to name a few recent purchases). These really must be my next purchase, I can feel my happiness slipping away every time I realise that I STILL don't own them. I do hope The Boy is reading this as it is my birthday soon - hint, hint. I love them so much! I may have to wait + put them on my christmas list! p.s. have you heard about the vintage fair at waterloo?